Situated amongst the fertile vineyards of Anderson Valley, Mendocino County, the unique pyramidal structure introduces the casual passerby, visitor or genuine enthusiast to the varietal wines of the small but progressive Greenwood Ridge Winery. The client desired the structure to be warm and inviting, constructed of native redwood and fitting comfortably into the site. The interior volume of the pyramid is filled with natural light from a glass-covered opening at its peak. Generous exterior decks expand the floor space beyond the interior, allowing guests to linger while enjoying the tasting experience, as well as the views. All interior furnishings, exterior landscaping, signage and gates designed by Aaron Green. The building consists of a combination wine tasting and sales room, plus conference room and office on the main floor (2,475 s.f.) with a lower level partial basement for storage of packaged bottles in cartons for shipping (1,700 s.f.). 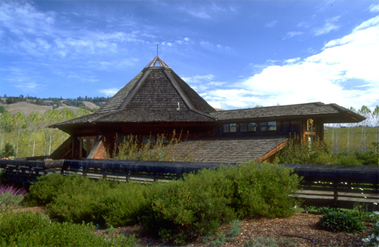 All rough-sawn redwood used in the building was reclaimed from a single log. The 6'-0" diameter log had been felled by lumber operations approximately 30 years previous and had lain in a relatively inaccessible ravine near the winery until the winery discovered it, pulled the log out, and then milled it with portable sawmill equipment brought to the site.